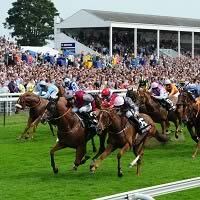 Dean Ivory completed a double at York when Tropics claimed an eventful renewal of the Sky Bet Dash. The five-year-old added to his gains in a handicap at Windsor last month with a determined effort under Robert Winston. Summerinthecity was a worthy rival, but he could not quite peg back the 9-2 joint-favourite in the £50,000 handicap over six furlongs, in which Khubala was third. Amy Ryan suffered a nasty-looking fall after Bogart's saddle slipped approaching the final furlong, but appeared to be unscathed as she walked back to the weighing room. The stewards held an inquiry after the first two came close together in the closing stages, but the placings remained unaltered. Ivory said: "He's a fantastic horse. I can't say how pleased I am for everyone at the yard to get him here and for us to do the double at York. It's phenomenal for us. "He's a horse that doesn't help himself. He just travels so strongly and wants to win. He very often gets to the front too soon. "He kept finding more but he was up there for a long time and he's still very raw so he doesn't yet know quite what's asked of him. "He's in the Stewards' Cup at Goodwood next Saturday, but we'll give it a couple of days, see what the ground is. "He's won today so we are very satisfied and there are lots of other races around for him. I'll just take my time and make a decision in the middle of the week."